It looks like a pile of trash until you turn on a fan. 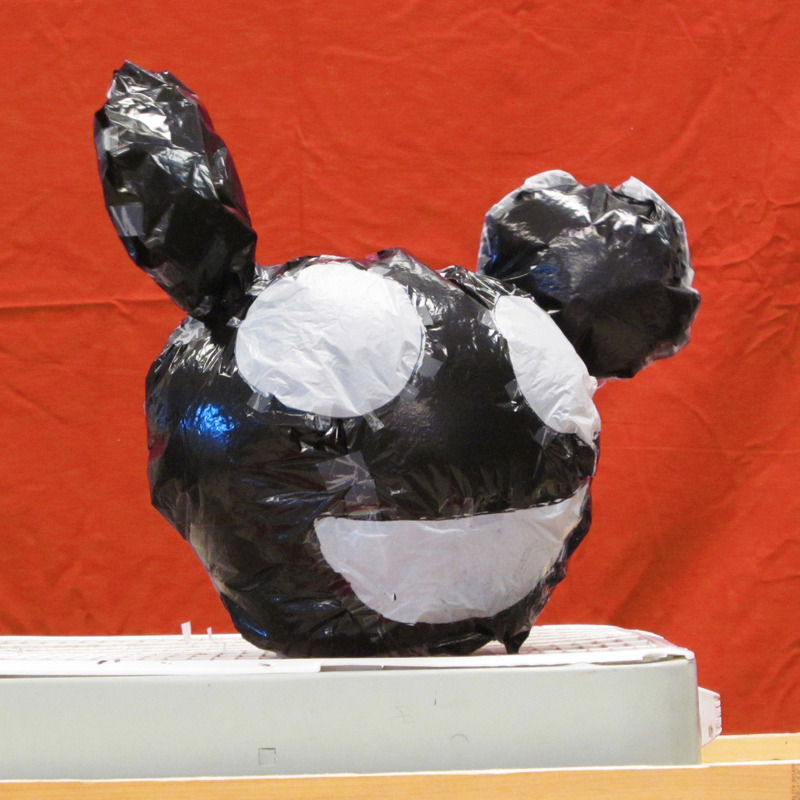 In this lesson, high school students break into groups and create an inflatable creature using garbage bags and tape. This process requires trial, error, and revision. After attaching them to a fan, these kinetic sculptures inflate and deflate, constantly moving and changing over time. This lesson was inspired by contemporary artist Joshua Allen Harris. To teach this lesson, you will need: garbage bags and/or plastic shopping bags (try to obtain them from a recycled or donated source, or have students collect them), black and metallic sharpies (black sharpies draw on white bags, metallic sharpie draw on black bags), scissors, lots of clear tape, a box fan, and five 40-minute periods of your time. 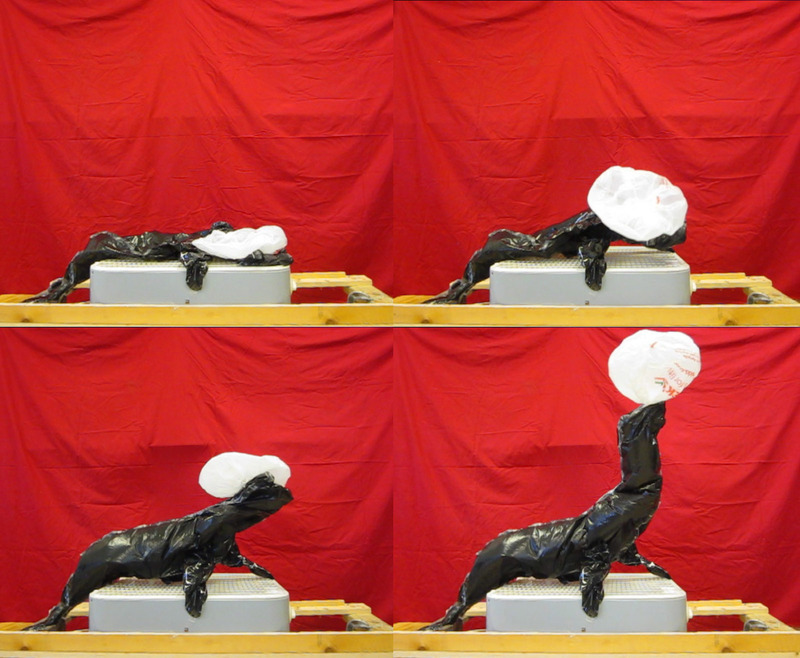 Essential Questions: What effects can time have on a sculpture? Is it important to make public art durable to withstand time? What are some ways that we are slowly destroying our earth & what can artists do to help? As the subway erratically passes underneath his kinetic sculptures, the temporary bursts of air pressure create a cycle of life and death for his creatures. Because Harris uses both trash and air pollution in his work, his “Air Bear” sculpture was picked up by the Environment Defense Fund for a commercial aiming to fight global warming. Along with re-purposing materials, Harris is interested in the surprise, pop-up element to his work; his youtube channel primarily captures passerbyers’ reactions. Because they look like trash when they are deflated, Harris occasionally loses a sculpture to an innocent street cleaner doing his or her job. These sculptures are delicate, impermanent, and constantly change over time. 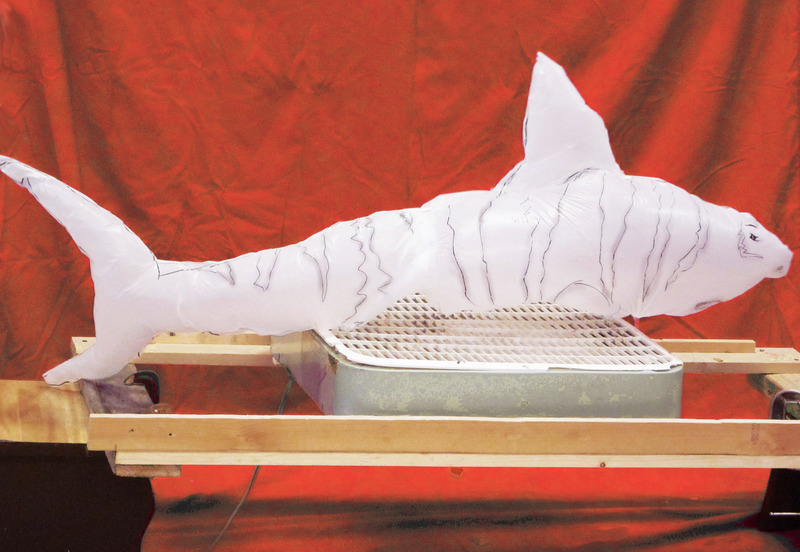 Before you ask students to start this project, make sure you make a few inflatable sculptures yourself. You will need your own experiences to advise and problem-solve with students as they make their own. These sculptures require a lot of trial, error, and revision, but the more prepared you are to set up the initial requirements, the more successful students will be. Put restrictions on your students’ inflatables regarding height and overall scale to ensure success. 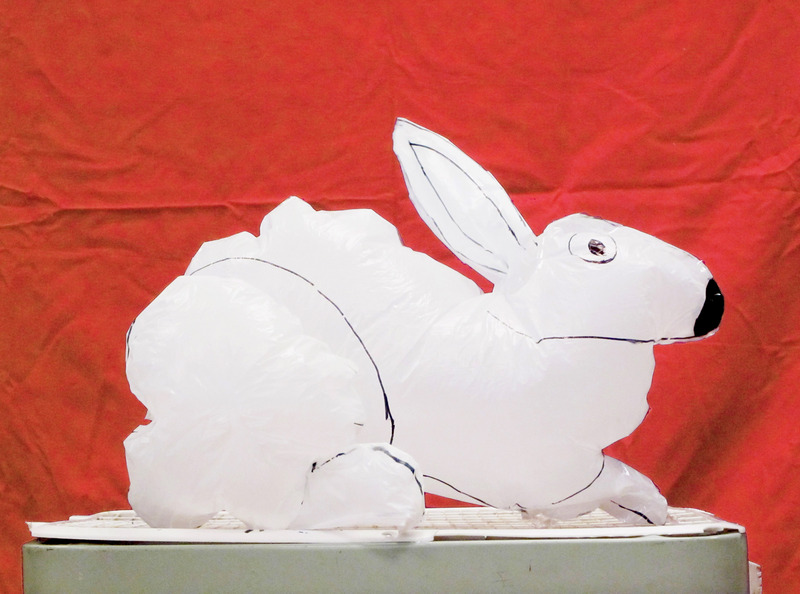 Depending on the power of your box fans, a sculpture that is too tall may not inflate. A tiny creature (1-2 feet wide or tall) will be too stiff from the tape to inflate; likewise, a creature with thin antennae or limbs will need to be exaggerated to become thicker. A sculpture that is attached to the fan using a large, flat surface (like a belly) will have a greater chance of success than one attached by small tubular forms (like arms and legs). If any groups want to break the rules, let them, but explain to them to be prepared that it might not work. 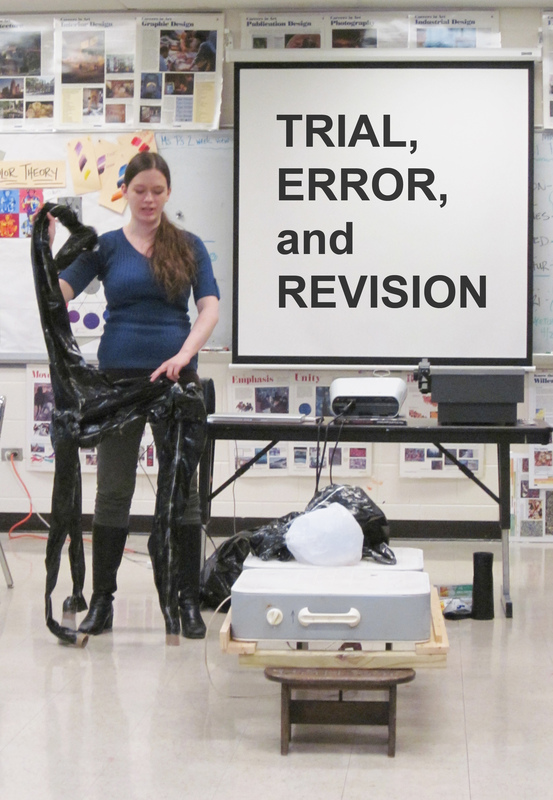 Emphasize trial, error, and revision in their art making process. On the first day, introduce the artists and the project, present your exemplar, and have students break into groups of 3-5. Have them come to a consensus on the type of creature they will create. I recommended that my students choose a creature that has a large base. Afterwards, students need to break down their creature into it’s main parts. It may help if they print out references photos and draw their creature from above and from the side. 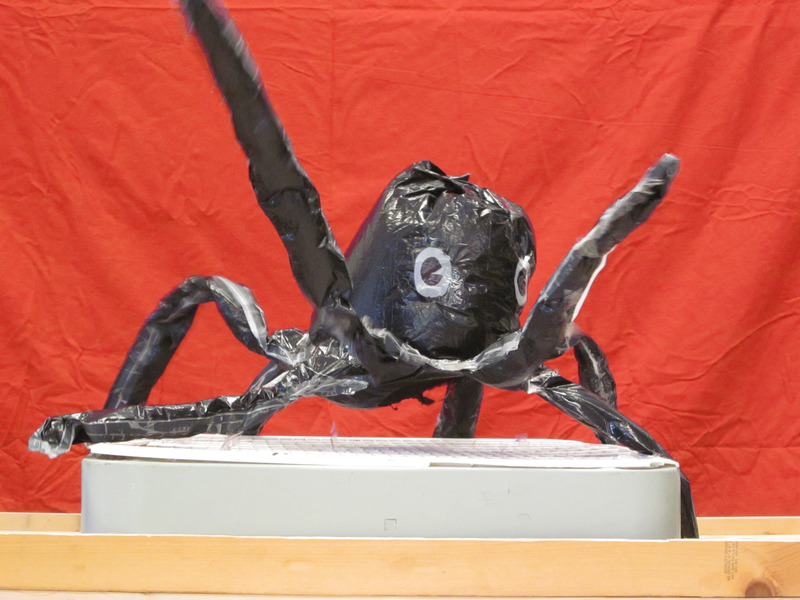 On the second day, students need to start drawing their creature’s parts on a garbage bag and cutting them out. (They can approach each part from either the top view or from the side view). 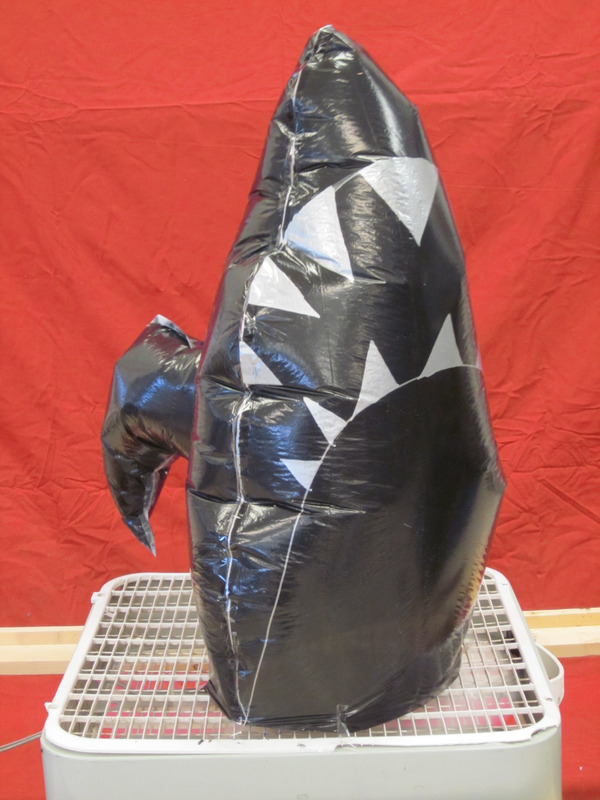 As each of the creature’s main parts should be symmetrical, keep the two sides of the garbage bag pressed together. This way, when students cut out a shape from the bag, they will actually be cutting out two of each shape (static electricity should easily keep the two sides together as you cut). Once a shape is cut out, tape the edges together. Not every inch needs to be taped–they can leave open spots. On the third or fourth day, start taping each piece (ears, head, torso, legs, etc) together to form the creature. Leave holes between each piece so that air will fill the entire thing, and additionally cut a hope in the bottom of the creature to attach to the fan. Before presenting it on the last day of class, make sure that each group tests their creature on the box fan to make sure it properly inflates. Many will need to be slightly revised before they are finished. Edit, added 11-2014: View this guide by Learning Technologies for a great idea about the sculptures’ bases–use tagboard around the edge of the base and attach paperclip hooks so sculptures can easily be set up and removed from the fan. Thanks Keith! 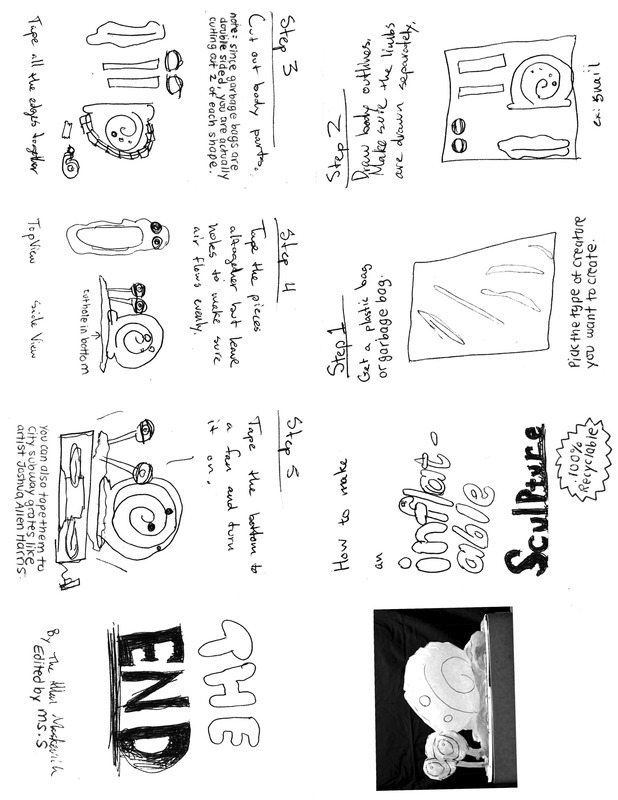 Download this student-made zine (an 8-page booklet folded from an 8.5″ x 11″ piece of paper) for printable directions on how to create an inflatable sculpture. Objectives: Students will: 1). In groups, choose a creature that has a large base, sketch it, and break it down into main forms. 2). 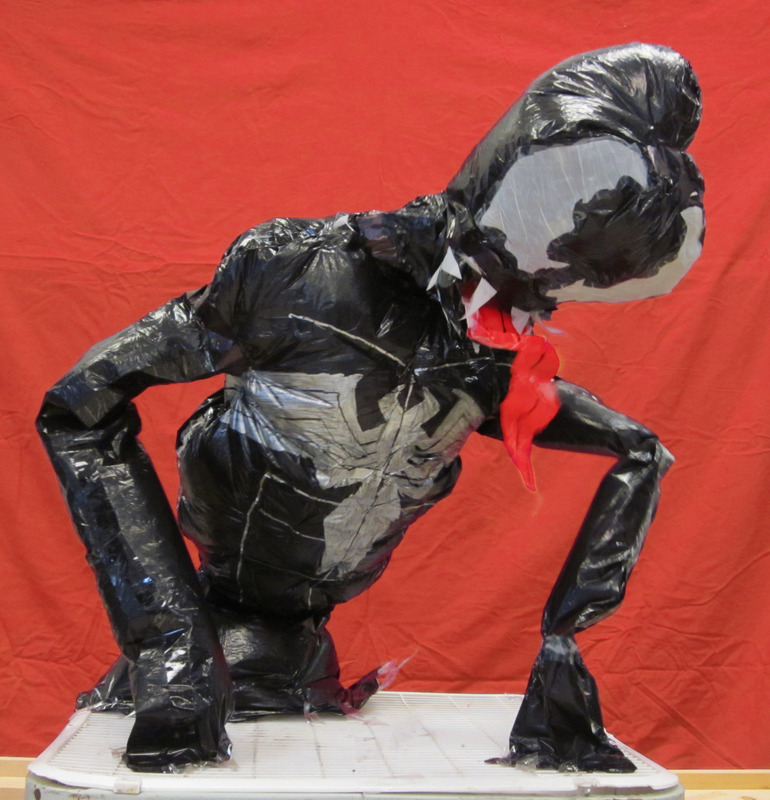 Cut out 2-dimensional shapes representing the creature’s torso and limbs from garbage bags, tape up the sides, and then tape the entire creature together, leaving holes between the connecting parts. Test their sculpture on a fan to ensure that it properly, and revise it as necessary. 3). 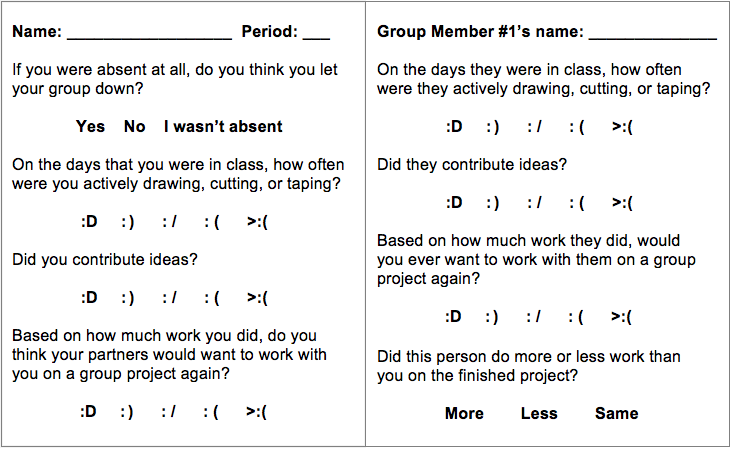 Present it as a group on the last day, fill out self- and peer-evaluations, and reflect on the process. State Standards: 25.A.4: Analyze and evaluate the effective use of elements, principles and expressive qualities in a composition/performance in dance, drama, music and visual arts. 26.B.4d: Demonstrate knowledge and skills that communicate clear and focused ideas based on planning, research and problem solving. 26.A.4e: Analyze and evaluate how tools/technologies and processes combine to convey meaning. 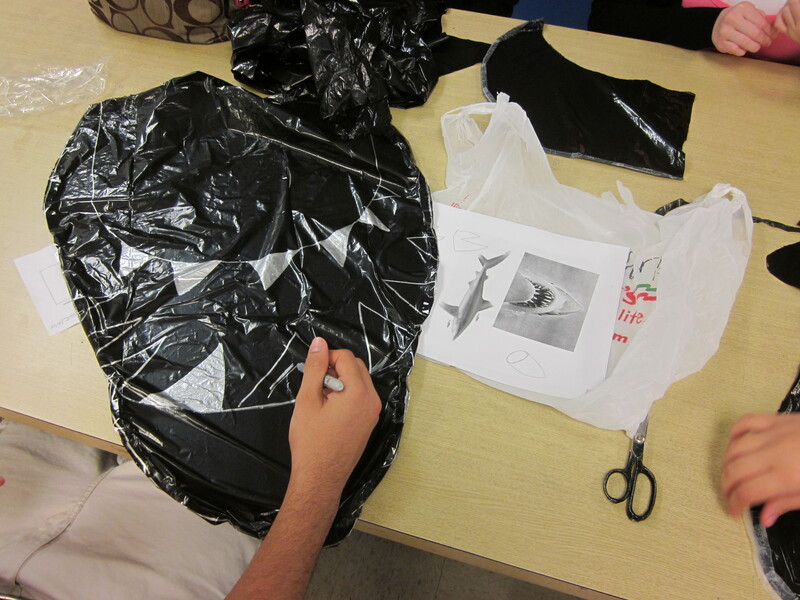 Literacy: Students will be encouraged to write a zine explaining the process of making an inflatable sculpture. Adaptations: Help select students find a group that they will work comfortably in. You can assign them one small task that they can become an expert in (cutter, taper, sketcher, director) instead of working on the entire process. If you have any questions, suggestions, or comments, please leave a reply. Awesome! That’s what it’s here for. I would love to see pictures of your students’ work when they are done! Apologies for the very late reply. I’m glad you found something useful on my blog! I have a lot of respect for the Science Museum of Minnesota’s interactive team. I work over at The Field Museum developing exhibitions, and SMM recently produced some great interactives for The Machine Inside: Biomechanics. That’s awesome! The tagboard bases and paperclip hooks are a huge improvement in comparison to what I was doing. Thanks for sharing and thanks for the call out in the snapguide post. Thank you, I’ve just been looking for information approximately this topic for a while and yours is the best I have came upon till now. However, what in regards to the conclusion? Are you sure in regards to the supply? Thank you for such a thorough explanation! How do you grade your students? Did you make up a rubric for this project? Hi Courtney, apologies for the late response. I graded students on their in-class effort each day and on how well their sculptures inflated. Any sculpture that “worked” on the last day had clearly been through rounds of testing and revision. I didn’t put together a final grading rubric for students to actually see the breakdown, but I should have you’re right. what kind of lesson plan are you looking for?